A town in the government of Ekaterinoslav, Russia, on the left bank of the Don, about twenty-four miles from Rostov and five miles from the sea. In ancient times it was an important business center, belonging to Greece and known under the name of "Tanais." The Pontic king Mithridates conquered it in 115 B.C. ; in the fourth century of the common era it was destroyed by the Huns; and in the eighth century it was rebuilt and passed into the possession of the Chazars. In the twelfth century, when Azov was a store-city for the trade with Indo-China, the Genoese carried on a considerable trade there, at first recognizing the sovereignty of the Polovtzy, whom in the thirteenth century they drove out; and in 1471 they themselves were conquered by the Turks, who in 1637 were for a short time subject to the Cossacks. Since 1736 Azov has belonged to Russia. Jews have lived in Azov since they began to settle in the Crimea and in the neighboring provinces, probably in the first century B.C. In the time of the Chazars they were largely interested in the commerce of Azov with Constantinople and Dankov. From the latter the Russian products were transported down the Don to Azov, and all imported merchandise was forwarded from Azov to Dankov. Azov is mentioned in an epigraph on the first page of a Pentateuch written in Azak, stating that one Shabbethai, son of Isaac, during his illness, on the twenty-ninth of Marḥeshwan, 5035 , presented this Bible (twenty-four books) to the "Karaite Synagogue in Kirim" (D. Chwolson, "Yevreiskie Nadpisi," p. 217, St. Petersburg, 1884). Another epigraph, written on a board in the Karaite synagogue in Theodosia in 1404, relates to Isaac, son of Moses, and Sarah, daughter of Moses, and to the mother of their mother, Kellah of Azak (Azov), who "have put up this board in the synagogue of the community of Kaffa, the community of the Karaites" (ib. p. 209). 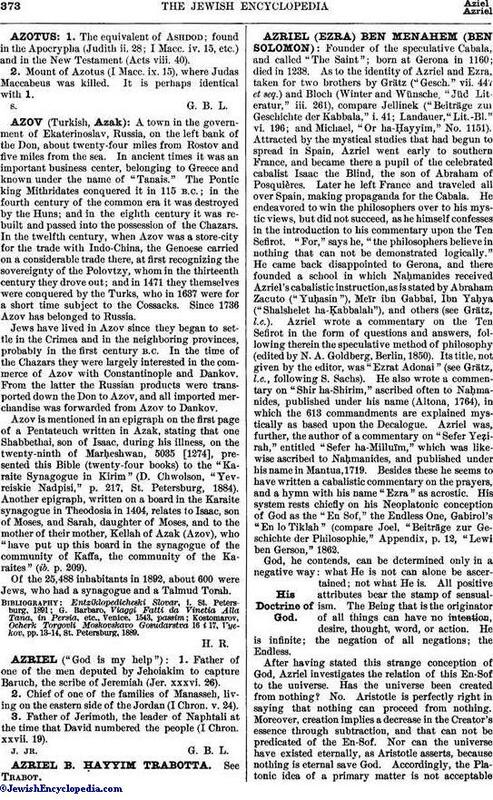 Of the 25,488 inhabitants in 1892, about 600 were Jews, who had a synagogue and a Talmud Torah. Entziklopedicheski Slovar, i. St. Petersburg, 1891; G. Barbaro, Viaggi Fatti da Vinetia Alla Tana, in Persia, etc., Venice, 1543, passim; Kostomarov, Ocherk Torgovli Moskovskavo Gosudarstva 16 i 17, Vyekov, pp. 13-14, St. Petersburg, 1889.